I was minding my own business, busily dusting the house, when I heard a rustling. A weird sound was coming from the houseplants sitting on top of antique trunk. There was a rustle, rustle. A few leaves were bouncing up and down. I walked over and found the not-at-all camouflaged cat. It looks like she’s hiding, doesn’t it. I think she thinks I can’t see her. The clicking of the camera shutter causes her to peak out. I still think she thinks she’s hidden. She gets this look on her face when she’s half under a blanket, or halfway hidden behind something. It’s a kind of serious, “you can’t see me” look. I think she is reliving the wild jungle days of her ancestors. 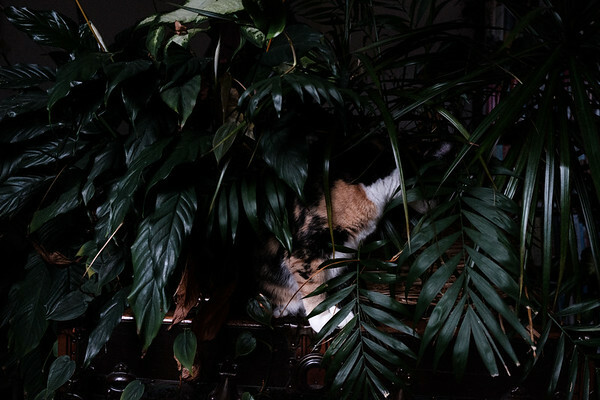 Luckily she just hides and plays in the houseplants, she doesn’t bother them at all. No eating or chewing and no using them for a littler box like Coco kitty! Wow! Those are splendid photos in the greenery. Definitely suitable for framing! She found a great background for her Mama to take some nice picture 😀 I like the photos so much! Thank you for joining the Pet Parade. You’re such a good looking kitty and it’s good to have a place to hide. 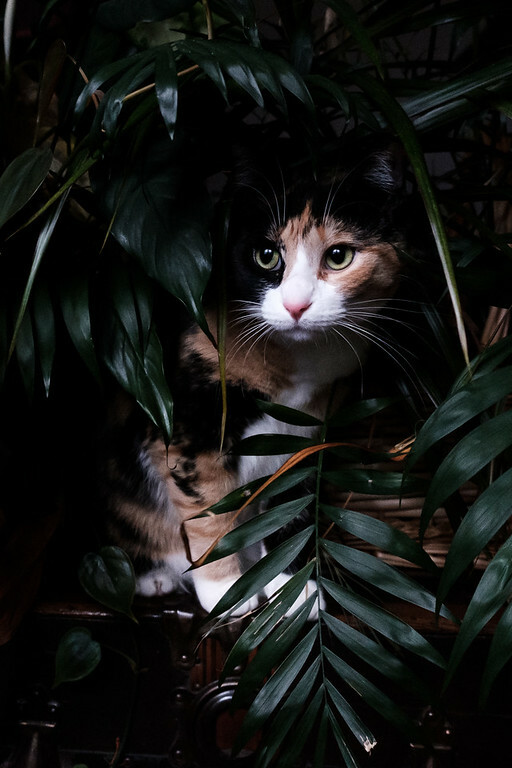 That is so darn cute and such a pretty jungle kitty! Thanks for joining the Thankful Thursday Blog Hop! Love that! We know she thinks no one can see her. Oh you made us laugh with your mischief (and your filter). That is SO sweet! Such beautiful photos. 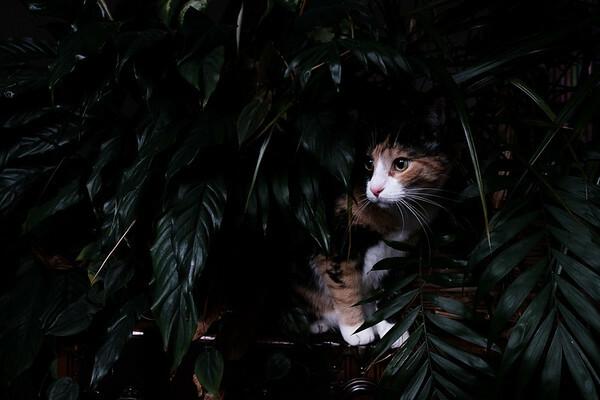 We adore your compositions this week, so moody and evocative of a hunting feline. The dark colours really do shine with a feline camouflaged (or not to the human eye at least) in their midst. Hide and Peak! Is there a cat amongst those leaves? We hear a rustling…O THERE you are!!! So sweet. I like that…”wild jungle days of her ancestors.” These moments remind us where they came from. She’s adorable. It’s so great she doesn’t mess with the plants. I could never get a cat that wouldn’t so no houseplants for me. those are GORGEOUS photos!!!!! You should get the cat tree that I have from Pet Tree Houses…..it is made from real wood and the leaves look real (they can be chewed but do not come apart. ) Cody loves it and he feels like he is in a jungle! Oh, we definitely need to get a cat tree around here! She has such a sweet expression as much as to say,”If I sit still, no-one will know I am here.” I love the artsy effect. Beautiful! Each one taking my breath away … Thank You! Oh my goodness! So cute. My cats do the same thing. They try to hide under the covers or the curtains but their bums or tails are sticking out and they really think we can’t see them! Ha! Cats.